What happens when barriers of entry are lowered in all dimensions? (cost, time, risk) for small software companies that intend to tackle specific business problems for the benefit of specific audiences these lowered barriers mean the ability to concentrate scarce resources on the key problem to solve, avoid distractions by challenges that are important but most of the times irrelevant to the core mission. This is probably the oldest story in the software world, at the risk of dating myself I should say I remember the times when detecting a keystroke in a keyboard and turning on/off an specific pixel (or digit segment) in a screen was a problem we solved once and again in each application.. Operating Systems came along, Database Engines came along and all those important (but irrelevant to the core mission) challenges seemed to be taken care by someone else; there was a cost associated to it but the gain in opportunity was completely worth it. I am not the first or the best to sing the praises for the benefits that the advent of the likes of Amazon Web Services (storage, computing power, database), MongoDB + 10Gen (Scalable DB + Commercial Hosting), Zuora (Payment Solutions), Twilio (Voice and Text Based Services) have brought to the software industry at large (along with a few risks, of course). I also should point out that is very clever to “solve a problem everybody has to tackle” and offer it as a platform service, SaaS companies will come and go and yet the solution you offer will still be needed by those that remain. 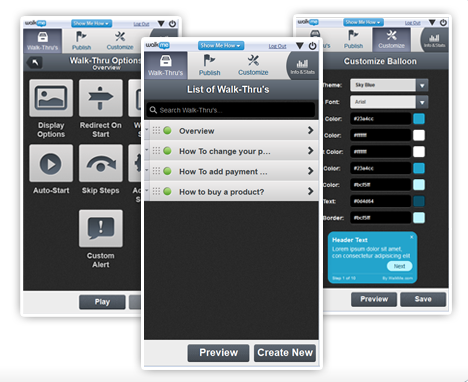 A couple capabilities that really excited me about WalkMe was they offer an editor for non programmers to create these walk throughs as well as an API for a more in depth and sophisticated integration, the other very important capability is that Walkme instruments all of the walkthroughs and allow you to analyze if users are actually exiting any flow before achieving the desired result (do you have a usability bottleneck? some bug that may have gone unnoticed before? ), you can create new walk through’s on the fly if you realize users need help / guidance completing a particular task.